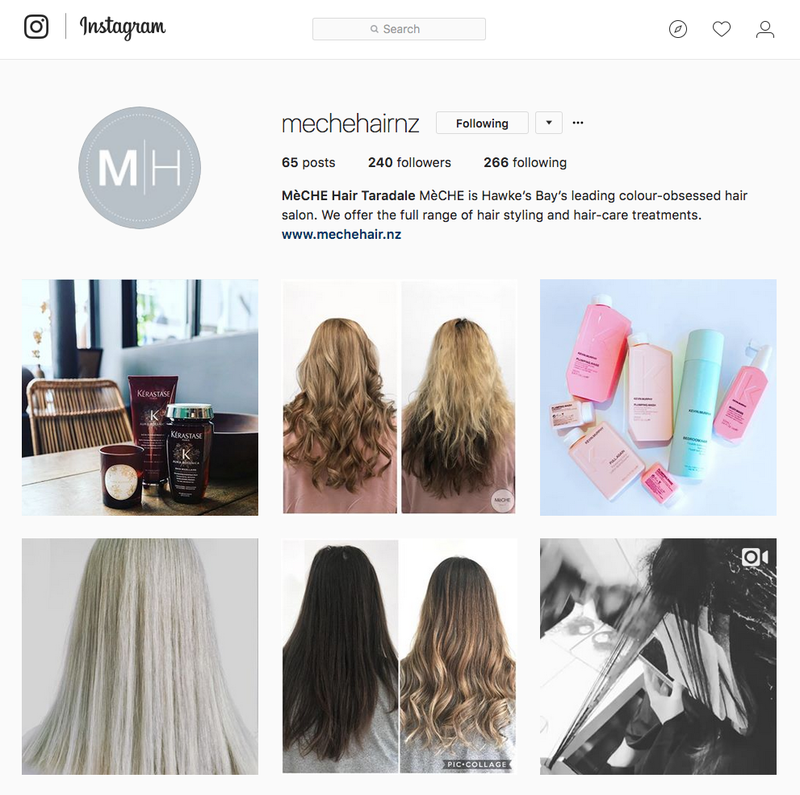 MèCHE (previously Visāge) is one of the best-known names in Hawke’s Bay’s hair and beauty scene. Oozing cool and with a reputation for being at the cutting edge of hair and beauty styles, trends and techniques, MèCHE has a large and loyal client base. Development of that reputation has been helped by a long and fruitful relationship with local brand and communication agency, Ed (Empire Design). Established as Visāge Hair Designers over 20 years ago, the business has expanded over the years to offer a full range of hair and beauty services across two premier outlets: a salon in Taradale, providing hair styling and hair-care treatments from cuts and colours to straightening, smoothing, balayage and ombres; and a salon and spa in Havelock North, providing a full array of hair, beauty and day spa services. Way back in 2003, Visāge owner Kay Deakin responded to a cold call from the man behind Ed, Stefan Olsen, to see what magic he might be able to conjure up for her business. MèCHE Salon & Spa at 7 Joll Road, Havelock North. Ed provides a full suite of marketing and communications services to businesses and organisations of all shapes and sizes. Stefan picked Kay’s brain on her vision for her business. 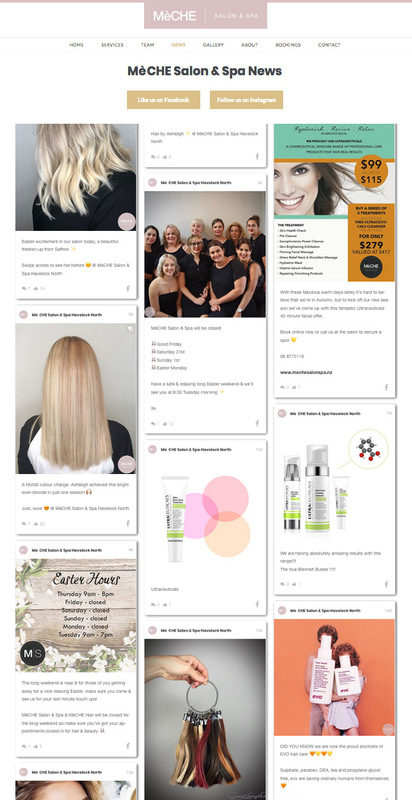 From there, Stefan got to work crafting a strategy that covered all aspects of advertising, marketing and communications for the salons’ discerning client base throughout Hawke’s Bay. Over the next 15 years Ed built a trusted and close relationship with Visāge, producing a vast array of print, press and digital material; and carrying out copywriting, graphic design and website development services. 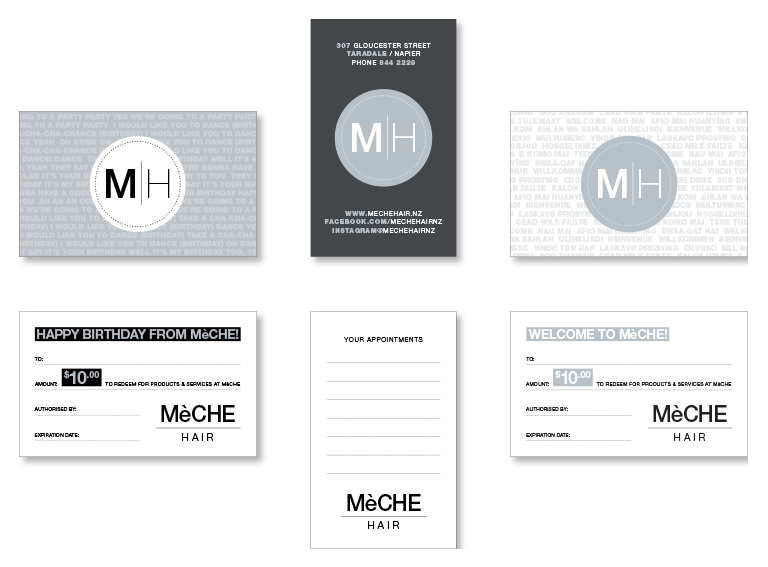 The primary brand marks for MèCHE Hair (MH) and MèCHE Salon & Spa (MS). The division of the hair salon and day spa in 2005, with the salon remaining in-situ and the spa moving to new premises in Taradale. A brand refresh in 2009 under the name Visāge Hair and Visāge Beauty. The opening of the Havelock salon and spa in 2011, then named Visāge Hair & Beauty. A full rebrand from Visāge to MèCHE from 2017-18. 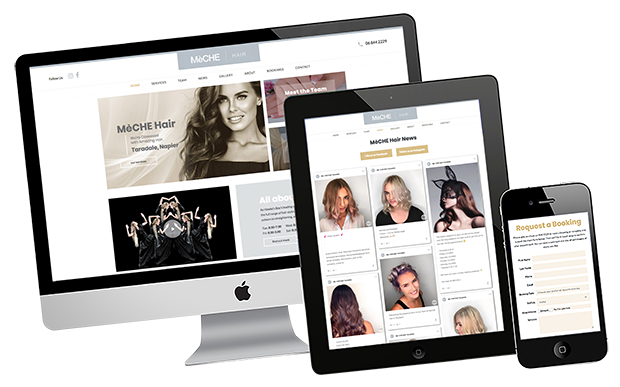 MèCHE offers a comprehensive array of salon services. 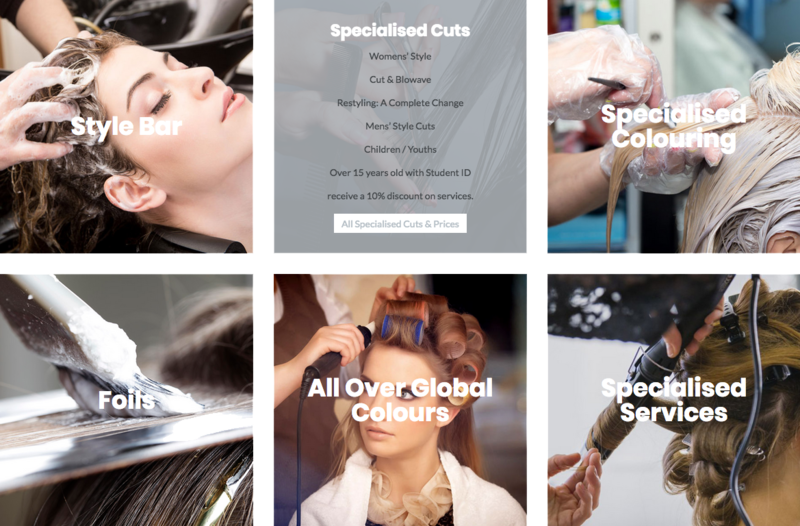 Stefan’s top-down approach to producing compelling collateral for the salons has been to understand how the business operates, from clientele and staff to environment and systems. By being patient and sensitive to the ebb and flow of modern business, Stefan has remained agile and responsive to the Visāge / MèCHE needs. He pays attention to the details of the business, its requirements, and what Kay wants; and the result is thoughtful, effective and targeted collateral that is the ideal balance of provoking and stylish. The MèCHE team at the annual Hair & Beauty Awards 2017-18. Not one to rest on his laurels, Stefan is proactive about coming up with new ideas to help grow the business. His dedicated, honest approach and willingness to take risks has definitely paid off. Aided by Ed’s persuasive marketing and brand guardianship, Visāge experienced growth of more than 300% – reflected in staff numbers, square feet covered by the business, and net revenue. MèCHE email newsletter open rates and click rates consistently sit well-above industry averages. In 2017, careful consideration of what was best for her clients and herself led to Kay selling the Taradale-based beauty and day spa, along with the name Visāge, to a long-term employee. This left Kay facing the massive challenge of rebranding the business without losing the client base she’d worked so hard for. A simple, robust and effective brand architecture is malleable across all digital and print collateral. To launch the new brand a model representing the core target audience was well researched. Rebranding is a slippery slope for any business and requires so much more than just a new name. Alienation of clients, loss of brand recognition and reduced profits are just some of the hurdles companies face when rebranding. 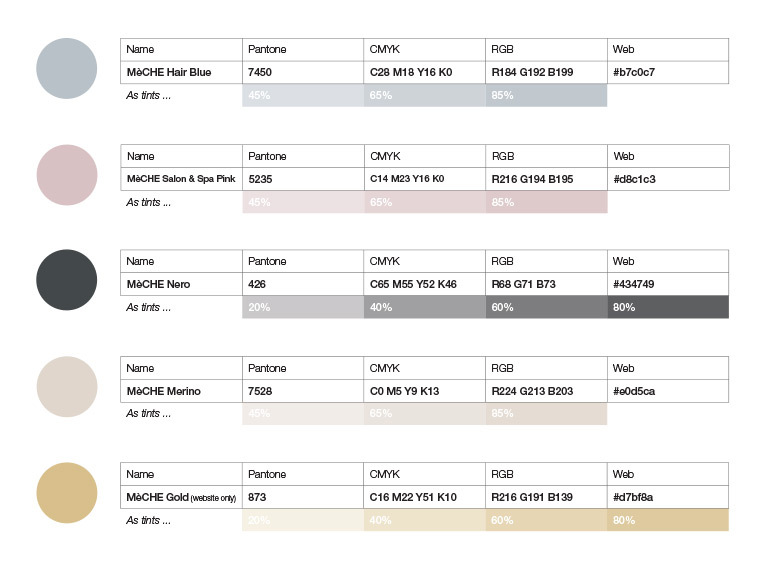 Colours for both MH and MS were researched, trialed and chosen to work across all mediums. After listening to Kay’s vision and ideas, Stefan provided Kay with options for a new logo and branding identity, including names, themes and colours. 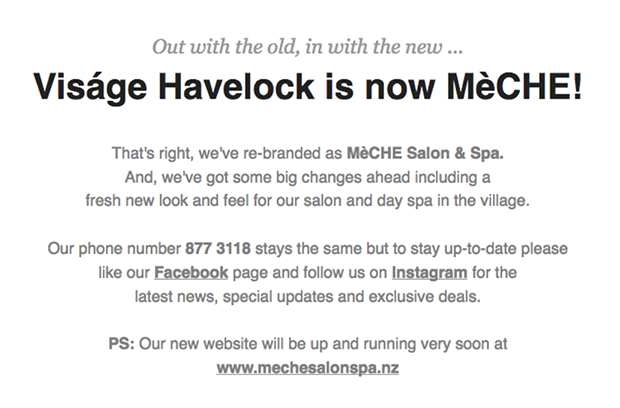 A new identity was born: MèCHE Hair (MH) in Taradale, and MèCHE Salon & Spa (MS) in Havelock North were officially introduced to clients in November 2017. Ahead of that, Stefan took a full-service agency approach to developing a strategy to apply the new identity to all aspects of the business – the Havelock North and Taradale salons, covering both the hair and beauty services as well as the product retail side of the business. 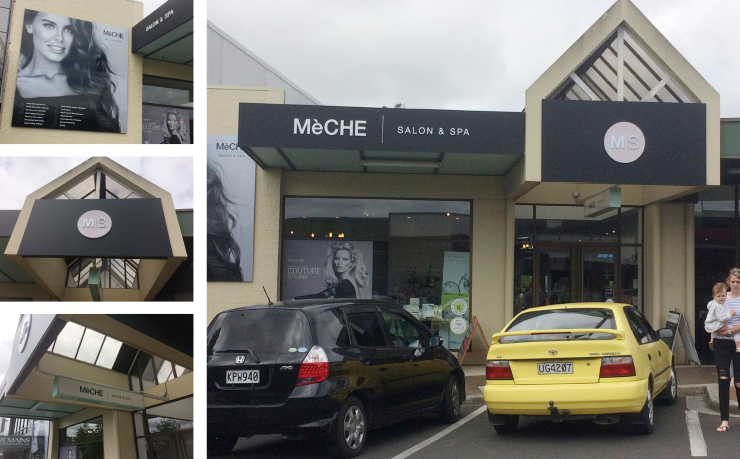 MèCHE Hair at 307 Gloucester Street, Taradale, Napier (rear shot top left yet to be completed). Logos for the full name for both branches, plus abbreviated options. In-store collateral including appointment cards, pricelists, new customer cards, birthday cards, and vouchers, folders and stickers. 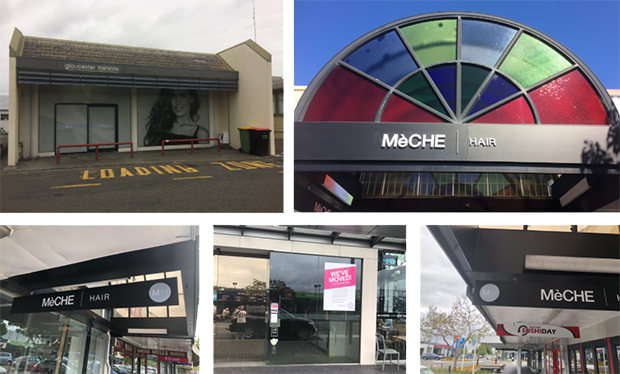 A range of signage in different formats for the front and rear of MèCHE Hair, and for the front of MèCHE Salon & Spa. 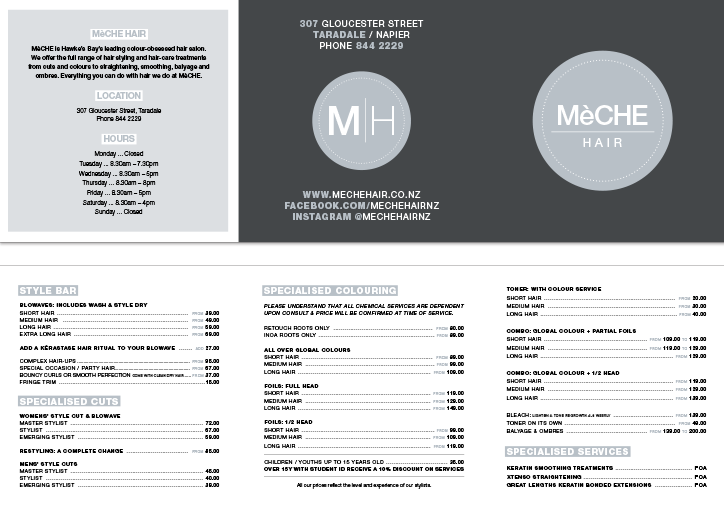 The MèCHE Hair price-list is a 148mm square format printed on 300gsm matte offset. 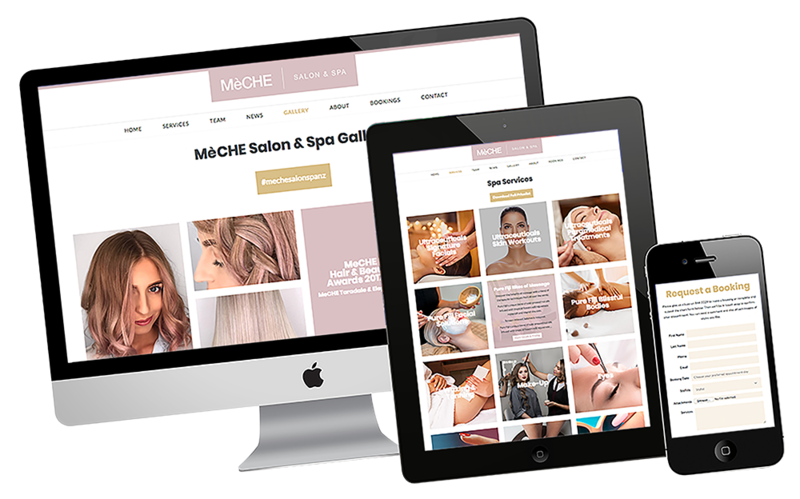 The MèCHE websites were built in WordPress with custom-designed templates and functionality. Unable to integrate the websites directly with MèCHE’s in-house booking system, Stefan designed an innovative solution: a slick and functional booking form for clients to request appointments. The resulting websites are clean and stylish, with visually effective branding elements and practical functionality for both clients and the business. Assets for social media platforms were created with a clear strategy for ongoing communications. Keeping customers informed of the changes afoot was a priority, Stefan crafted messaging for social media and email communications to clients, designed a new branded template for regular newsletters and managed the client database for distribution of communications. He also set up the business email addresses and signatures incorporating new branding elements. The MèCHE tone-of-voice was established at the outset for use across multiple media channels. Stefan diligently set-up Facebook and Instagram pages for both branches using branded graphics. Not one to leave his clients to flounder, he also supplied MèCHE with collateral, tips and advice for in-house day-to-day management of the accounts. Kay Deakin also celebrated 50 years in the industry at the recent MèCHE Hair & Beauty Awards. With Stefan’s expert guidance throughout the rebranding process, MèCHE has avoided all the pitfalls that many businesses face when overhauling their brand and image. Ed’s relationship with MèCHE – and particularly the marketing and communications strategy for the rebranding – have helped seal MèCHE’s future in the Hawkes Bay as a name synonymous with only the very best in hair and beauty services. MèCHE messaging is conveyed across all collateral, both digital and print. The latest news, updates and events are shared and collated in the websites’ news sections.